Things can get wild when you have your favorite pair of boots on – rodeos, festivals, concerts, and wherever else your boots roam. That’s why it’s important to learn how to properly take care of them. Cleaning your boots can be a quick and easy process, so you don’t have to lose sleep worrying about your precious boots. In five simple steps, you can have them cleaned and ready for action. What will you need? A boot jack, a sponge, a wash cloth, leather supplements – and of course, your dirty boots. If you’re not an avid boot-wearer, these tips can also apply to just about any leather shoes. 1. Use a boot jack to remove your boots. Boots are certainly not the easiest type of shoe to slip out of. 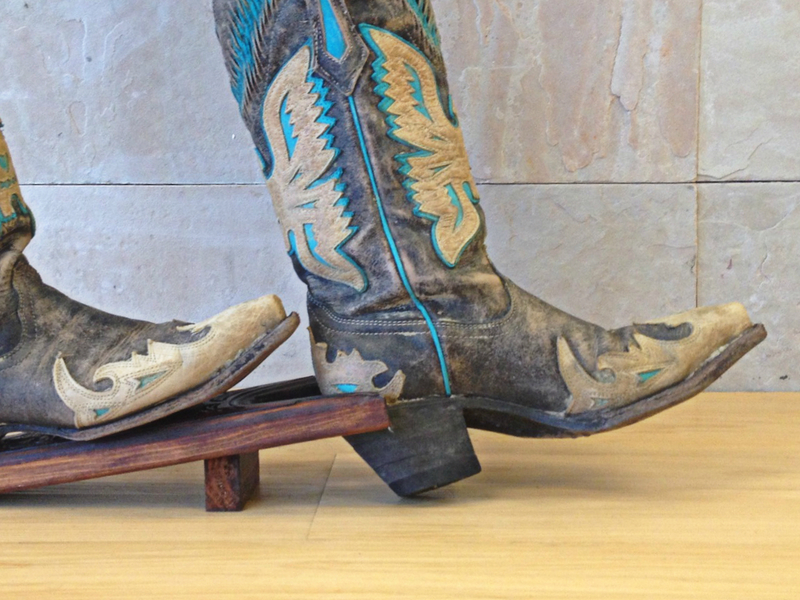 Take the drama out of removing your boots with a boot jack. Plus, this is a great practice to keep the heel of your boots in good shape. 2. Do a basic clean after each wear. 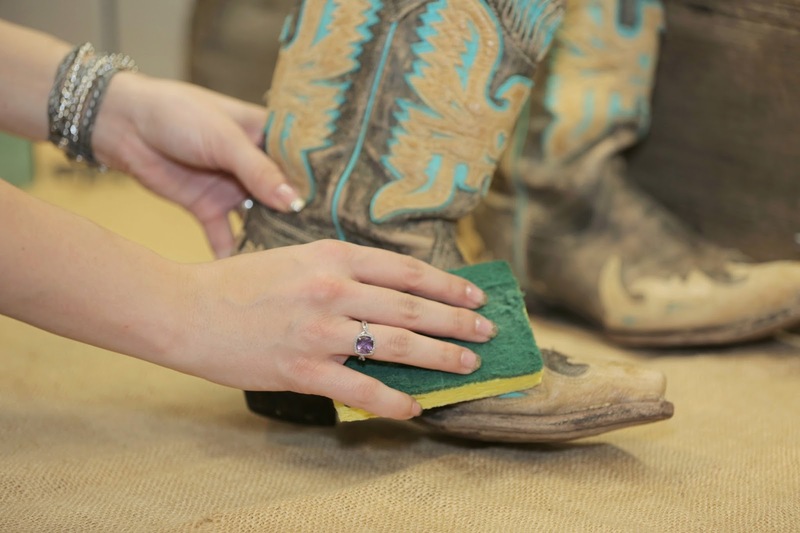 Each time your boots are worn, take a minute to wipe off any dust or unwanted particles. Trust us, doing this consistently will save you time and money in the long run. Dust, dirt, or mud left to dry on your boots will eventually weaken the leather and stitching causing splits or cracks. Never soak or wash the boots in heavy running water. We suggest using a damp sponge to remove areas where heavy mud has caked on and dried. Using a good boot or leather conditioner every 2-4 wears will keep the leather/skin of your boots supple and prevent the material from drying out. Apply small amounts of conditioner with a soft cloth or your fingers. Rub the conditioner onto your boots in a circular motion. Be sure to wipe away any excess conditioner with a dry cloth. As hard as you try to not wear your boots in the rain or mud, mother nature is bound to do some damage. We recommend using a leather care spray after each conditioning to help protect your boots from the unpredictable outdoors. Also, do not leave your boots in front of a fire place, stove, oven, or direct sun. This will cause the leather to dry out quickly and could lead to breaks or cracks. If your boots are damp or wet, let them air dry at normal room temperature before putting them away. Not doing so can result in mold, discoloration, or premature deterioration of the leather. 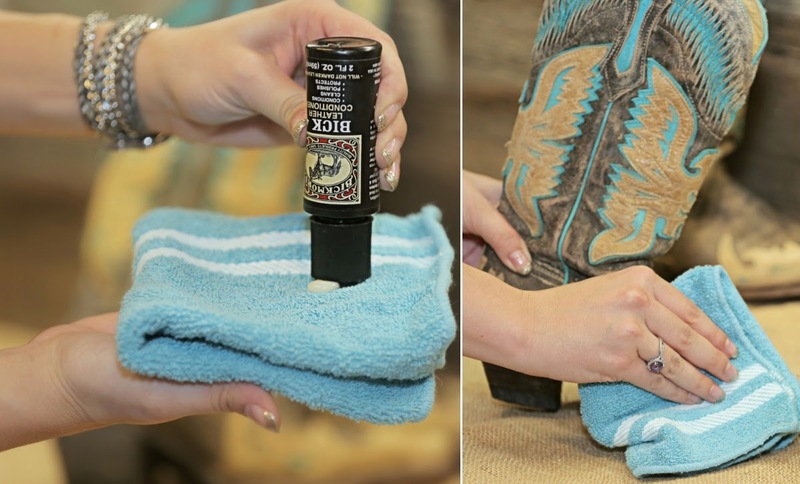 That’s all it takes – just a little TLC to keep your boots in great shape! Share your questions and comments below. And if your new boot care knowledge has you itching for some new leather, let us help you find your new favorite pair with a tutorial from our buyer, Ashton!